After 100 years in the service of Egypt and the region, AUC is commemorating its centennial by creating new opportunities for impact in the next century. You have seen what can be accomplished in 100 years. Now you want to set the future in motion. Egypt deserves a university strong enough to attract outstanding professors from around the world — strong enough to be, by this critical measure, one of the world’s great universities. AUC has been a beacon for talented students, regardless of their background. They all share a thirst for knowledge, a healthy sense of ambition and a passion to help their communities and their country. Great ideas are the product of collaboration between cultures, disciplines, and belief systems. We will use our two campuses as incubators for innovative solutions, inspiring visions and effective initiatives. AUC proudly stands as crossroads for the world’s cultures and has always assumed a role in exploring and addressing both domestic and regional challenges and utilizing its capabilities to find potential solutions. 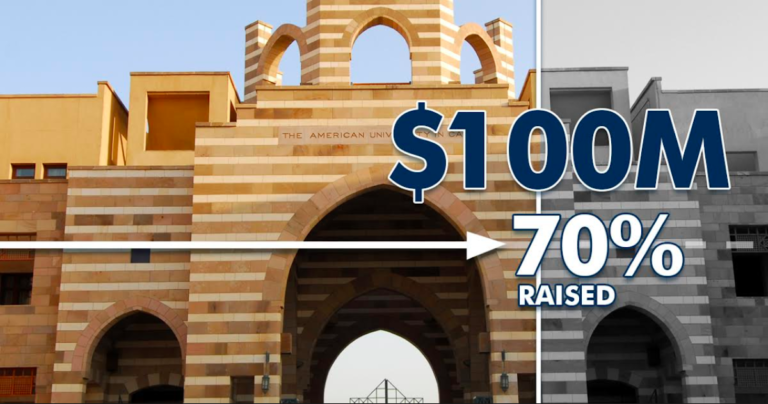 To know more about the Centennial Campaign, click here.